Apocalyptic literature, poetry, television, dance, politics, art and more were celebrated at Point Park University's Eighth Annual Undergraduate Research Symposium, hosted by the Department of Literary Arts. 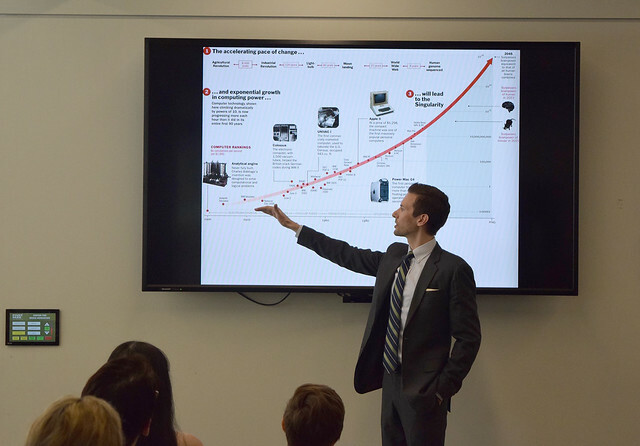 Held in the University's Center for Media Innovation and Academic Hall, the April 21 symposium centered on the theme of "Apocalyptic Thinking" and featured a variety of student panel and poster sessions. "With this theme, we tried to capture the sense of crisis we keep seeing in the media: political crisis, climate change crisis and so on," said Barbara Barrow, Ph.D., assistant professor of British Literature. Student panel and poster session topics included romanticism and revolution, LGBTQ resistance through revelation, childhood fiction, global warnings, personal and political apocalypses and more. "This symposium gives students an opportunity to see first hand all the fascinating research students and faculty are doing in literary studies, art, dance, mathematics, film and other disciplines," Barrow added. In the "Apocalyptic Poetry: Dread and Hopelessness" student panel session, senior creative writing major Paige Mastrippolito presented a poem she wrote titled, "You Are a Hurricane." "This event allowed me to gain experience sharing my work with people outside of my poetry workshop class. It was also a great opportunity to hear people's work from other genres and areas of research," Mastrippolito said. Matt Pelfrey, assistant professor of cinema, "Apocalypse is Perspective"
Colleen Hooper, visiting artist in the dance program, "Dancing the Post-Apocalypse"
Jessica McCort, Ph.D., assistant professor of composition and rhetoric, "'Poisonous Fruit': The Cannibalistic Threat to the Female Body in The Hunger Games and Cinder"
Brendan Mullan, Ph.D., assistant professor of physics, "The Horsemen of the Mathpocalypse"
Pelfrey talked about how apocalyptic thinking has shaped his projects in film and stage, while Hooper discussed her research as a dance historian and shared a piece she choreographed titled The Beast, that was set in a post-apocalyptic landscape. In her presentation, McCort highlighted young adult novels with apocalyptic themes that rely on the portrayal of a young female protagonist under constant assault by external forces that threaten her bodily integrity and identity. In the final faculty presentation, Mullan described the four apocalypses he believes are most likely to affect humanity: technology, overpopulation, energy consumption and climate change. "If I could leave you with one thing, it's this: Apocalypse means change, but we can control the trajectory of that change," Mullan said. "I encourage you to take the reins and direct that change towards good." Associate Professor of English Karen Dwyer, Ph.D., offered students, especially graduating seniors, advice: "Use your work to really stir it up. There has never been a more important time to do this well." McCort added: "This event is a great representation of the intellectual and creative spirit that thrives here at the University."